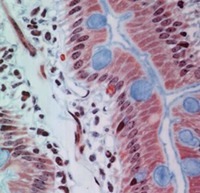 STRATIFIED COLUMNAR OR CUBOIDAL EPITHELIUM | Microanatomy Web Atlas | Gwen V. Childs, Ph.D. 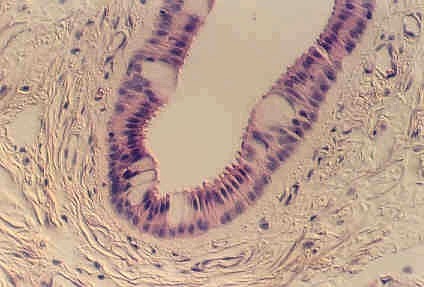 Stratified Columnar epithelium is rare. One place you can find it is in the largest ducts of salivary glands (parotid, submandibular, etc). 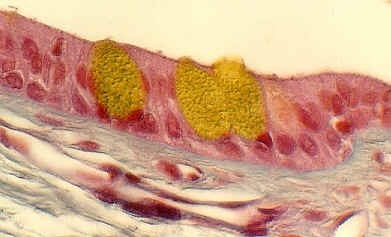 The basal layer of cells are cuboidal cells and the layer nearest the apical surface includes columnar cells. The large droplets are mucus, in Goblet cells. This also illustrates the fact that epithelia are classified according to the cells nearest the lumen, in this case columnar. 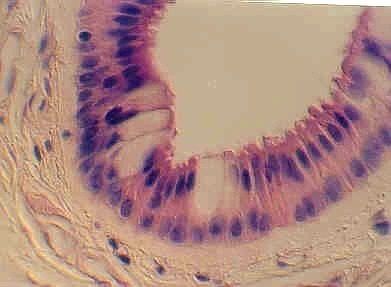 Below is another view of a large (excretory) duct of a salivary gland showing the mucin in Goblet cells after a special stain. 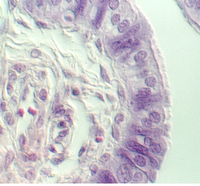 What might be the advantages of an epithelium that has a basal cuboidal cell layer and an apical columnar cell layer? 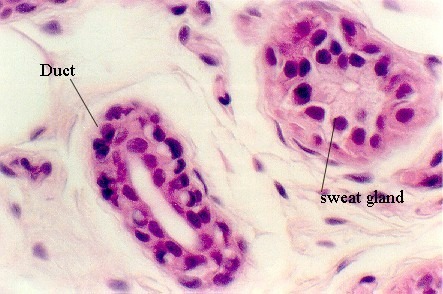 Sweat gland ducts are examples of stratified cuboidal epithelium...usually however there are only two layers of cells. 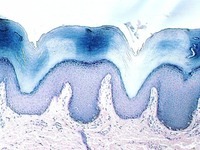 They can be found in your slide 25 (thick skin), in the dermis.